From the team behind Dead Rabbit comes this Pier A drinkery, designed to invoke American bars that fled to Cuba during Prohibition. BlackTail is positing a thesis: This is what a what an American bar would feel like if it moved down to Cuba during the Prohibition era. Serious study has gone into the creation of this spot from the same team behind downtown’s Dead Rabbit, an ode to Five Points–era New York. 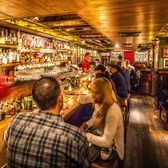 The dark wood-walled space houses a reproduction of John Vanderlyn’s “Landing of Columbus,” a bust of Cuban liberator José Martí, as well as barstools meticulously copied from Ernest Hemingway’s favorite Havana haunt, El Floridita. A live band, and servers outfitted in guayaberas and fedoras keep the place from feeling too stuffy as you pick out a drink from five categories: highballs, punches, sours, old fashioned, and cocktails. While the classics are on the menu, they have been tweaked with global modern ingredients, like tonka bean and goji berry. The signature rum and cola does indeed have rum and coke, but is augmented with amaro, bitters, and Champagne. There’s a food menu as well, with Cuban-influenced bar bites including sweet plantains. Can’t get in? Try one of these great places instead. Dead Rabbit is a revival of a grocery and grog we misplaced sometime in the last century.